Small ionized and neutral structures in the Galactic diffuse interstellar medium, on scales of astronomical units to kilometers, are frequently observed. However, no single theory satisfactorily explains all data. Various observations seem to indicate that these objects are overpressurized with respect to the medium. It is not clear if the fraction are "things" (discrete objects) and how many can be explained as "spooks" (part of a power spectrum). 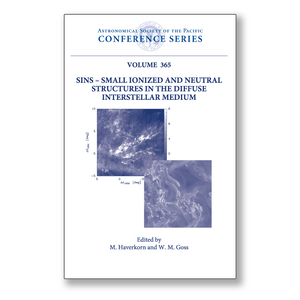 These proceedngs of the SINS meeting in Socorro, NM, in May 2006 bring together recent work on observations of ionized, atomic and molecular small-scale structure, theory, and numerical simulations. Extensive observational and theoretical reviews of the meeting are included.